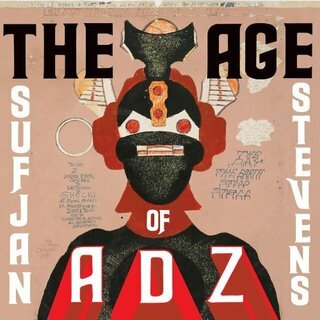 Hot on the heels of last month’s “All Delighted People” EP comes Sufjan Steven’s new CD, “The Age of ADZ”. Attention Deficit Zebras? Autistic Disordered Zoologists? I don’t know1. What I do know is that this will soon be called Sufjan’s “Kid A”, largely because it’s got keyboards and bleepy things and drum machine whatnots on it. And that it’s not very good *cough*. Ok, that’s possibly a bit harsh. Right now I can safely say it’s not what you’d call an immediately catchy record, and that it’s also safe to say it’s going to take a few listens. Then again, 2010 is now officially The Year Of Disappointing Records By Bands That Should Know Better (Or Maybe Have Run Out Of Ideas And Are Desparately Flailing Around). TYODRBBTSKB (OMHROOIAADFA), as we call it round here. Because let’s face it, with Band Of Horses, The Hold Steady and Broken Social Scene making Disappointing Records (with Arcade Fire and possibly Joanna Newsom not far behind, though I’ve not quite made my mind up yet), the auguries are not good for our old chum Sufjan. Still, buy it, stream it, listen to it all you like, and try “Vesuvius” on me2, and make your own minds up. 1 According to the spiel, “The Age of Adz refers to the Apocalyptic art of Royal Robertson (1930 –1997), a black Louisiana-based sign-maker (and self-proclaimed prophet) who suffered from schizophrenia, and whose work depicts the artist’s vivid dreams and visions of space aliens, futuristic automobiles, eccentric monsters, and signs of the Last Judgment, all cloaked in a confusing psychobabble of biblical prophecy, numerology, Nordic mythology and comic book jargon.” Bet you wish you hadn’t asked now. As for this bit: “Sufjan has stripped away the fabric of narrative artifice for a more primitive approach, emphasizing instinct over craft”; doesn’t that translate as “Sufjan couldn’t be arsed doing those 12 minute long compositions with a full orchestra in 13/7 time, so he just switched on his Logic Pro 9 and fucked about for a bit”? 2 Ok, not on me as such, more the record label. Note: I’ve just found that the MP3 below isn’t one of the ones hosted on the record label’s site. So, to be safe, I’m removing it. Sorry if you’ve come here expecting “Vesuvius”. I’ll post a replacement track tonight.